Appropriate for attorneys, prosecutors, and judges, this title answers the most common questions pertaining to Florida DUI cases. It covers important state-specific issues, such as accident report privilege and admissibility of statements. 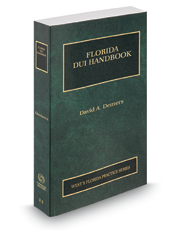 You also get the full text of every relevant Florida statute and regulation, plus case law on DUI.